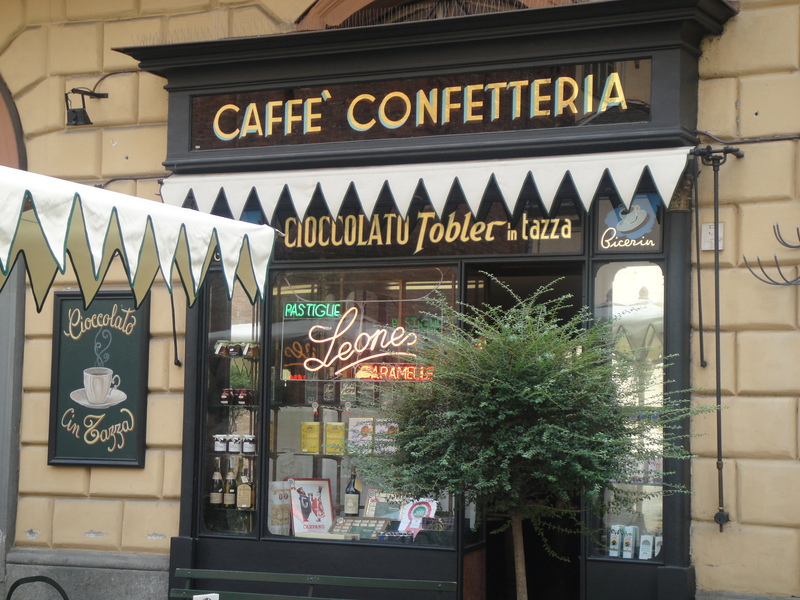 I came to Piazza la Consolata in Turin, Italy, because I had to taste a famous drink. Il bicerin is served at what may be the smallest cafe in Italy, a cozy place with 8 tables (double that in summer, when more are set outside on the old stone piazza). Caffe Al Bicerin opened in 1763, and not much has changed since then. Same counter and wrought iron, same kinds of pastries and chocolates. The shop windows and shleves are filled with jars of sweets, as they were more than 2 centuries ago, when aristocratic women swept in on Sundays after mass to refresh themselves. Like them, like Dumas, Nietzsche, Puccini, and Count Cavour (Council president of the first united Italian government) before me, I’m sitting at a marble-topped table and sipping something sublime. 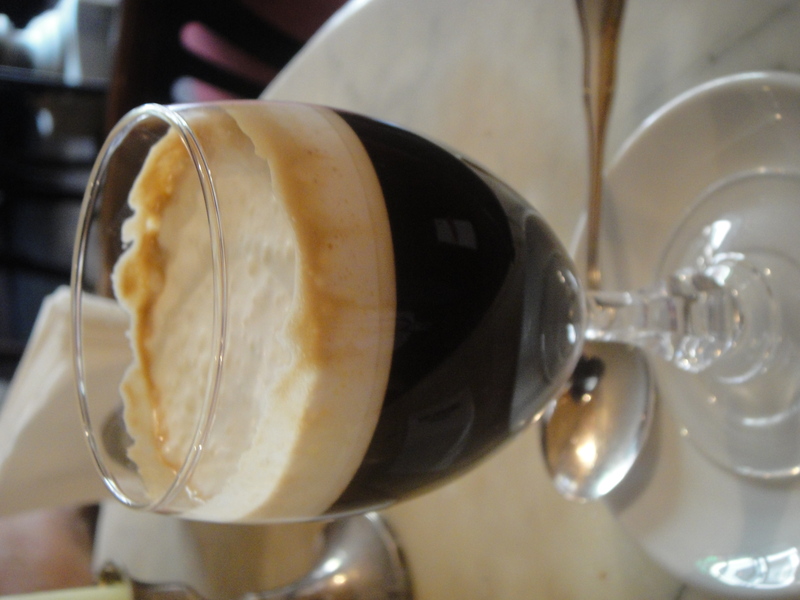 The mixture of espresso, chocolate, and cream is divinely rich, thick, and delicious. The cold layer of cream rests on the hot chocolate and coffee and I’m told you never stir it in, but drink the chocolate through the cream, mixing hot and cold, dwelling on each flavor as it slides over the tongue. You can get other drinks here, including teas, frappes, spumante, and Barolo, but I’ll come back for the bicerin. If you need more consoling after that experience, cross the piazza to what I consider the most beautiful church interior in a city full of gorgeous churches and monuments. Santuario Basilica La Consolata is jaw-dropping splendid. Designed by architects Guarini and Juvarri in the 17th century, it combines Baroque and Italian Rococo styles. The Romanesque tower that was part of a previous church still stands on the right side of the Basilica. 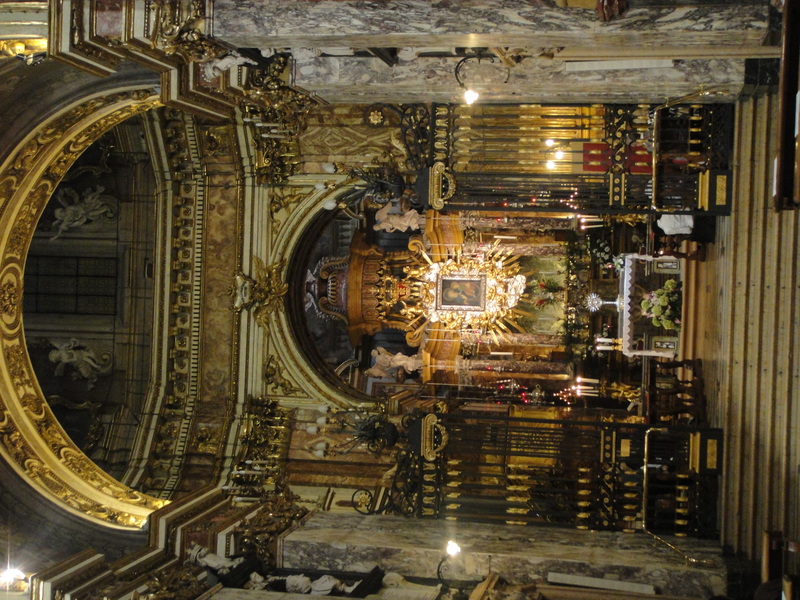 There’s a gorgeous marble floor and a high altar, dating from 1714, that is lavish with silver, marble, carvings and gilt. 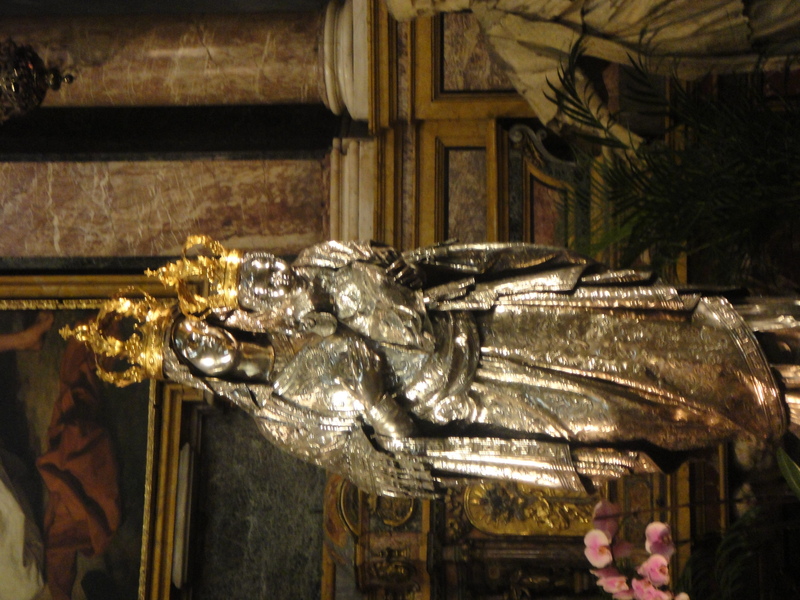 On one side stands a lovely silver Madonna and Child; this figure is paraded through Turin every June in recognition of the Virgin’s protection of the city. Most moving to me is a wall on a lower level that holds a huge ex-voto collection. These are drawings made by people asking for help or giving thanks for a miracle, whether it’s a motorcycle accident, an overturned tractor, a hospital scene, a battlefield, or other misery. It’s enough to make you light a candle and go have another bicerin. Mole Antonelliana is an odd structure. Here in the heart of an ancient city in northern Italy, a city best known as the home of the Shroud of Turn and the Fiat automobile, is a huge building with columns, a curved roof, and a skinny spire on top. It is the city symbol, and it’s dedicated to cinema. The monument started in 1863, when the Jewish community of Turin (Torino in Italian) hired architect Antonio Antonelli to design a synagogue. What with one problem and another, it didn’t work out, and Turin had a white elephant on its hands. Various ideas were tried, and one stuck: a temple to film. The National Cinema Museum is 167 meters high (or maybe 164, I haven’t personally measured it) and said to be the tallest museum in the world. Since it opened in 2000 it has drawn thousands of film buffs–and many who just like movies and offbeat museums. That’s why I’m here in Mole Antonelliana, leaning back in a red lounge chair, gazing at a slice of an old Clint Eastwood Western. 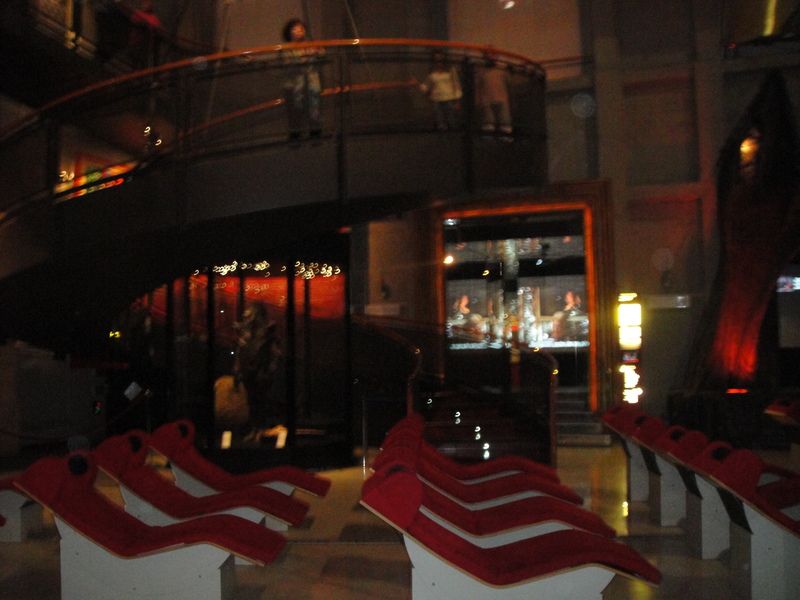 It’s playing in one of the many alcoves that show flickering American, European, and other films. 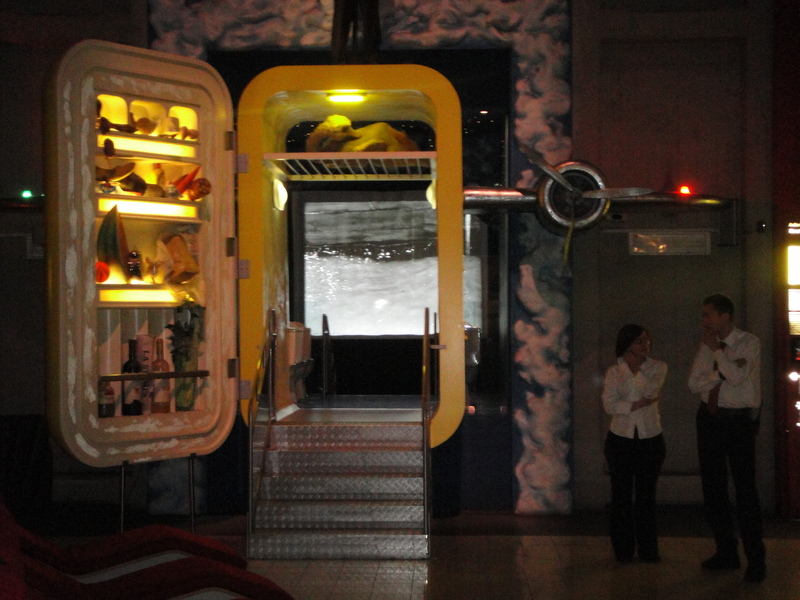 I catch a glimpse of Charlie Chaplin inside an alcove like an open, yellow refrigerator. Marilyn Monroe, in an outtake from The Misfits, is behind a bar that resembles Caffe Torino, a traditional local restaurant. 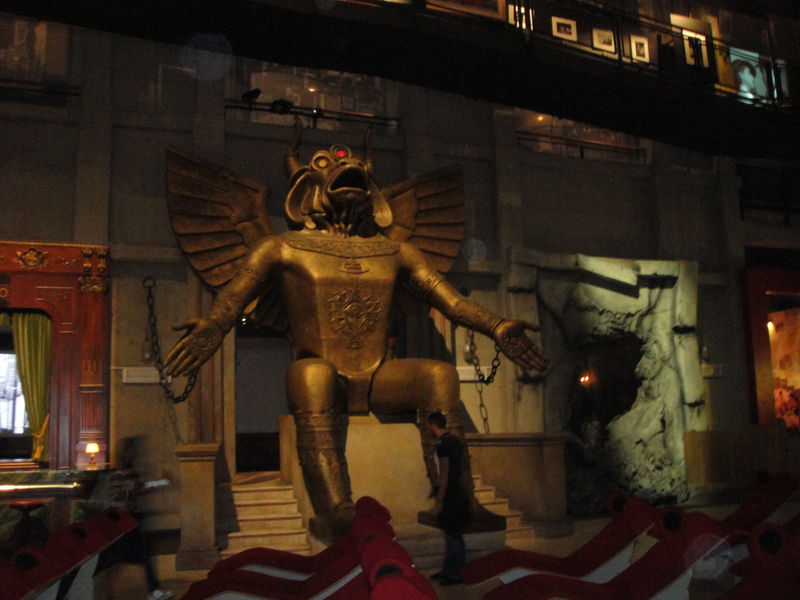 Off to the side is an enormous, fierce creature that must be an idol from a vintage film, and in another corner there’s a furnished living room complete with a TV from the 1950s. In the center of the big, darkened hall a translucent elevator speeds visitors up to the top floor, where the view of the city, the River Po, and, on a clear day, the Alps on the horizon, is spectacular. This is the best place to go for a grand view. In Mole Antonelliana (named for the architect), you can wander through the history of cinema and see graphic displays, photographs, posters, old TV shows, and many movie segments highlighting milestones in cinematography. There are ads, recordings, and a library of more than 7,000 films dating from the earliest days to the present. The sophisticated technology uses a software system to keep everything going; and once a day it aligns projectors so movies will fit with the daily curtain-raising. For 20 minutes, sunlight floods in to show off the building. The museum’s website, though it’s slow and less than informative, gives you a feel for the place. In keeping with its city symbol and love of film, Turin holds an annual international film festival, second largest in Italy after the Venice Film Festival, in late November. This year it’s honoring the director Robert Altman, who was an Oscar nominee 7 times and received an honorary Oscar a few months before he died, at age 81, in 2006. More than 40 of his films will be shown at the festival, plus TV programs from his 50-year career. 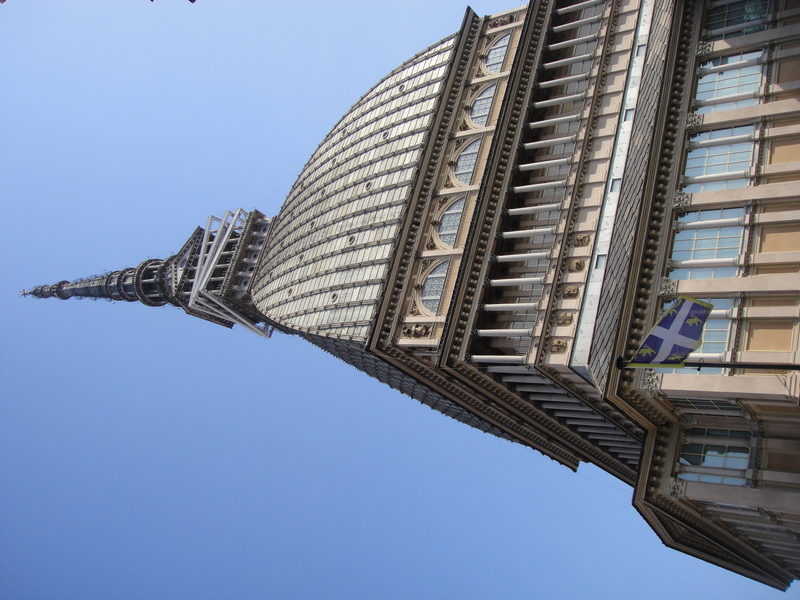 The festival is held in Turin theaters, with a photo exhibition in Mole Antonelliana.